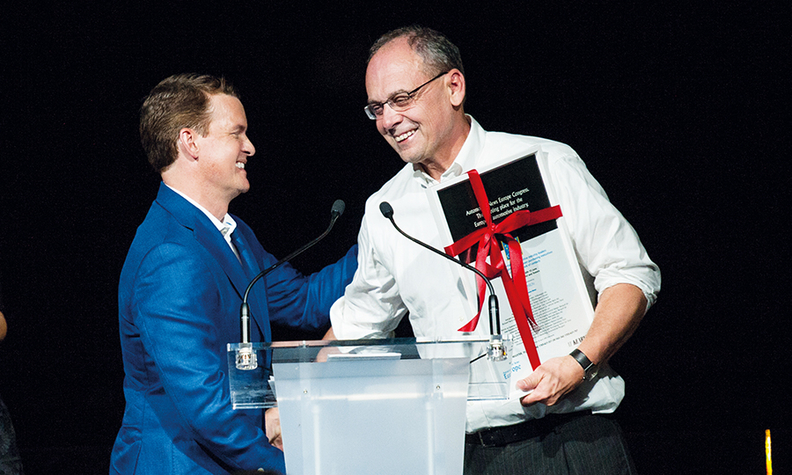 ANE Publisher Jason Stein, left, congratulates ANE Founding Editor Rick Johnson at the 20th anniversary Automotive News Europe Congress in 2017. Johnson received a framed program from the first ANE Congress, which was held in Brussels. When Rick Johnson relocated to Europe from Japan in 1995 to found Automotive News Europe, the European Union was a quickly expanding free trade zone. At the time, the bloc included 15 countries, which would grow to 28 over time. Back then, Europe had 28 different currencies as the euro would not debut until 2002. Since the publication would be written in English it was only logical that ANE be established in London -- so that is what Rick did. Fast forward to last month, when Rick retired after 35 memorable years with the Automotive News Group that took him from Detroit to Frankfurt to Tokyo to London and back to Detroit. ANE is still around, but what about Europe? I first met Rick in the mid-1980s when he was covering Europe for Automotive News from Frankfurt. I was immediately impressed. He was competent, extremely knowledgeable and straight-forward. Since that meeting we have gotten along extremely well, which is not something many people can say when talking about a boss, which Rick was to me for about half of the 30 years I have been with the Automotive News Group. We worked hard together -- really hard -- but we also had fun. That fun included trips to Modena to see and drive Ferraris, Lamborghinis and Maseratis. We also had a great time meeting with design legends such as Giorgetto Giugiaro and Sergio Pininfarina in Turin and bonding with American designers who share our love of Italian style such as Chris Bangle and Mike Robinson. Rick's No. 1 passion, however, was for news scoops, and I tried to make my boss as happy as I could. To be absolutely honest, he also made me as happy as possible, because he was always able to help me take my stories to the next level. The end result was always a much better story. One of ANE 's first scoops was our reveal of the retail strategy for the yet-to-be-launched Smart brand. We were the first to tell readers about Smart's plan to build those crazy glass tower dealerships. Rick and I both thought those glass towers looked like cathedrals built to celebrate a retail failure, which is exactly what happened. ANE 's hard-hitting reporting was not appreciated in Italy, where the publication clashed with Fiat several times, starting in 2001 with the firing of Fiat Auto CEO Roberto Testore. We wrote that Testore was used as a scapegoat to distract attention away from the failings of his boss, Fiat Group CEO Paolo Cantarella. As we predicted, Cantarella was ousted from his job seven months later. The only company that threatened to sue ANE (but never did) was Bugatti Automobili, which was run out of Modena at that time by Romano Artioli, who didn't appreciate our reporting of Bugatti's epic business failure. Bugatti did do something right. The unveiling of the EB110 in Paris in September 1991 was the most magnificent car launch I have witnessed in my entire career. It is not often that you get to experience a sit-down dinner for 1,100 people at the Versailles Orangerie. Every time an automaker objected to one of my stories Rick was always on my side. He trusted what I wrote and protected my sources. We were on the same page, in the good times and bad times. Finally, I do not remember ever having had an argument with Rick. Given that I am prone to argue, the fact that Rick and I never sparred over anything during more than 30 years of close and often intense collaboration is a testament to his professionalism, patience and class.